Rachel Lyndhurst: Who Knew Libraries Could Be This Interesting? Who Knew Libraries Could Be This Interesting? You know, I think cleaning the oven over the weekend was a big mistake. It's left me aching all over. Fortunately Rufus is poised with scented massage oils and my lovely pal Judy Jarvie is standing in for me today. Over to you, Judy! Thanks so much to Rachel for letting me visit her fabulous blog. I’m afraid I’m visiting with a confession – I worked in a library. But I never once met a handsome firefighter during all the years I toiled there stacking shelves and putting things back into the correct alphabetic order. More’s the pity. In fact I never ever met a boyfriend between the book carts. But as I tidied shelves and served borrowers I always wondered – what if! So that’s where the inspiration came from for Flirting With The Fireman. 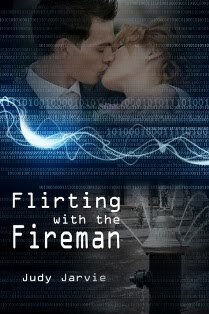 Flirting With The Fireman is the story of the cyber and social struggles of librarian and reluctant bridesmaid Flick Truro and the hottest firefighter best man in town – Rod McAllister. Flirting With The Fireman is the story of a career librarian – she’s no stuffy stereotype bun-wearer with a tendency to purse her lips and shoosh. She’s fashion conscious and sociable but she does have one big hang up. Rod McAllister brings out her strict and disapproving side. And that just makes him try to wind Flick up even more. I threw the two together by giving them key roles in Flick’s best friend’s wedding and VOILA. Sparks assured. Felicity Truro's diary is fast filling up with problems. First there's the ugliest bridesmaid's dress in the world, then there's her sick aunt's serious secret. But it's Rod McAllister, the handsome firefighter best man with attitude, who's melting her willpower and frazzling her nerves the most. Can Flick survive being a bridesmaid for the eleventh time whilst falling for the groom's aide for real? And how will she cope when Rod needs a stand-in and she's promoted to top of the candidate list?And if you enjoy Flick and Rod’s story - on February 14th my release from Embrace Books, Nanny Behaving Badly, will be launched. See http://www.judyjarvie.com/ for more information! Thanks for letting me pop by Rachel. I can't wait to read Storm's Heart which sounds dazzling - and the cover is beautiful!